Hotel Oberwaid - Das Hotel. Lock in a great price for Oberwaid - Das Hotel. – rated 9.2 by recent guests! Location very nice with great mountain and garden view. Staff in the reception was very good. 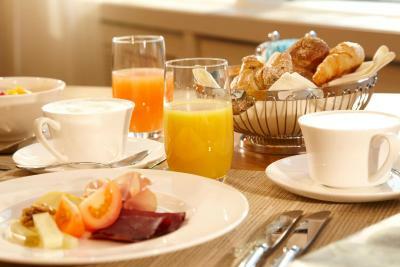 Excellent environment with very comfortable rooms, hotel with good facilities and provides great food. The hotel location is good , near to supermarkets, restaurants and petrol station, a quite place good for relaxing and chilling. The staff were welcoming and very friendly , the service was superb , breakfast was good The room was spacious and clean, with comfortable beds . Great room with a nice view on Lake Constance. Had a parking garage (15$ per night) but unlimited in-and-outs. Staff was very friendly and helpful. Explained everything for us. Gave clear instructions. I would certainly stay there again. Thanks to Emmanuel and Sonoma for their help. Staff very friendly and helpful to meet our needs. Live Jazz music in the restaurant on Valentines evening. We liked everything in this hotel especially the staff. I find them to be very professional and super friendly. Very friendly and welcoming staff. Exceptional services! Very nice hotel! 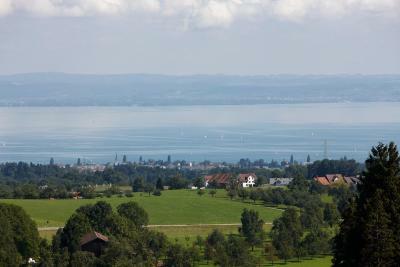 Beautiful location and view to Bodensee, excellent connection to city center, peaceful and quiet surroundings, modern design. Oberwaid - Das Hotel. This rating is a reflection of how the property compares to the industry standard when it comes to price, facilities and services available. It's based on a self-evaluation by the property. Use this rating to help choose your stay! One of our best sellers in St. Gallen! 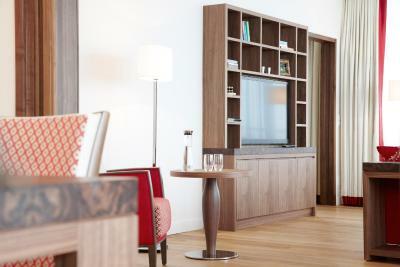 Just a 10-minute drive away from Sankt Gallen, Oberwaid - Das Hotel. offers a large wellness area, 3 restaurants serving fine cuisine with regional products, and panoramic views of Lake Constance. 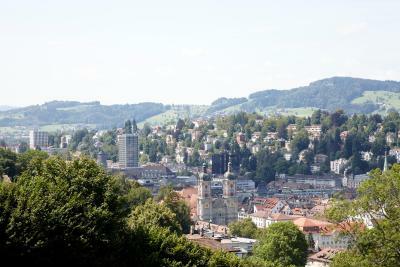 The hotel provides a shuttle service from and to St. Gallen Train Station at a surcharge. 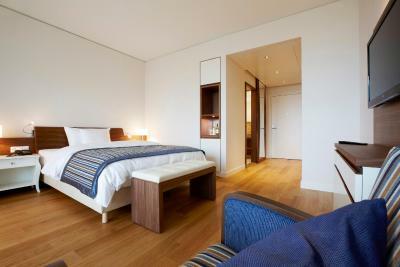 All of the spacious and modern rooms come with a flat-screen satellite TV, wooden floors and a seating area. 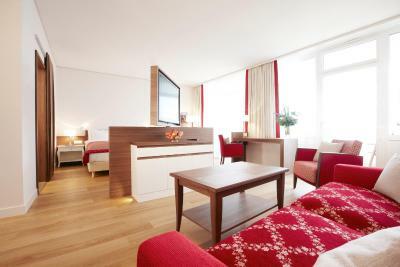 A balcony with views of the surrounding area and a bathroom with free toiletries, a hairdryer, slippers and bathrobes are standard in each unit. Free WiFi access is offered in each room. The spa area consists of a sauna, a hot tub, a Turkish bath, an indoor and an outdoor swimming pool, as well as a steam bath and treatment rooms. The access to the spa area is free of charge. A private spa for massages is also available, while cardiology treatments are offered by a German and Arabic speaking doctor. 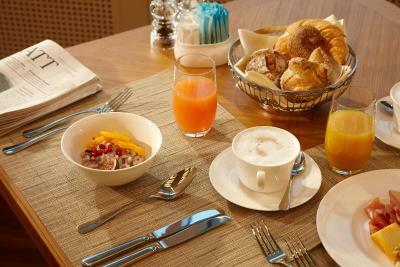 Each day, a freshly prepared buffet breakfast is served on site. You can also request room service. Upon request, the property serves halal processed foods and products. A gym for your daily workout is a further feature of the Oberwaid. A park-like garden with a sunbathing terrace surrounds the property. Car rental and concierge services are available on request, and a parking garage can be used against a surcharge. A bus stops 500 feet away and takes you to St. Gallen’s center within 10 minutes. The shore of Lake Constance is 3.7 mi from Oberwaid - Das Hotel, and St. Gallen-Altenrhein Airport can be reached within 20 minutes by car. When would you like to stay at Oberwaid - Das Hotel.? Modernly furnished room with a flat-screen satellite TV, wooden floors and a balcony with views of the private garden, the lake or the mountains. 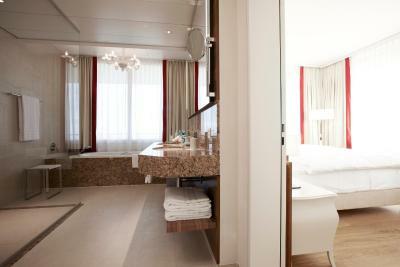 The provided bathroom is fitted with free toiletries, slippers, bathrobes and a hairdryer. Free Wi-Fi is available. Modernly furnished and very spacious junior suite with a living area featuring a sofa. The junior suite comes with a flat-screen satellite TV, wooden floors and a balcony with views of the private garden, the lake or the mountains. The provided bathroom is fitted with free toiletries, slippers, bathrobes and a hairdryer. Free Wi-Fi is available. Modernly furnished and very spacious suite with a living room featuring a sofa. The suite comes with a flat-screen satellite TV, wooden floors and a balcony with views of the private garden, the lake or the mountains. The provided bathroom is fitted with free toiletries, slippers, bathrobes and a hairdryer. Free Wi-Fi is available and the suite also has a walk-in wardrobe. This spacious room features a desk, a safe, a telephone, a flat-screen TV and a walk-in closet. It offers a seating area and a large bathroom with a shower, a hairdryer, bathrobes, slippers and free toiletries. This studio has a balcony, bathrobe and sofa. 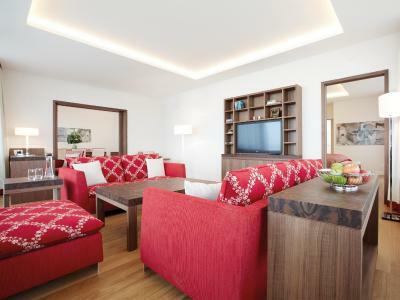 This suite features a terrace, seating area and satellite TV. This suite features a balcony, lake view and sofa. This studio features a balcony, sofa and dining area. This studio has a balcony, seating area and bathrobe. 4 reasons to choose Oberwaid - Das Hotel. House Rules Oberwaid - Das Hotel. takes special requests – add in the next step! Oberwaid - Das Hotel. accepts these cards and reserves the right to temporarily hold an amount prior to arrival. On New Year's eve there will be a gala dinner but no party. See all guest reviews for Oberwaid - Das Hotel. Newest Reviews for Oberwaid - Das Hotel. Beautiful hotel, amazing spa, great service. Perfect for romantic weekend, business trip, gateway! My favourite hotel in Switzerland! Perfectly clean and very close to St. Gallen city centre! Need to take bus from St. Gallen SFF. Super nice view outside the balcony. The hotel is spacious with a big garden! My husband and I had a morning walk to start the day! The door without lock 2 times the staff open the door even when I put the don’t disturb sign. The hous keeping need to be improved. It is a clinic! It smells like a hospital! Place is sterile and reminds one of a sanatorium. Really? ... neither a coffee machine nor a refrigerator in today's world. Well we flew over the "cuckoo's nest" and will not come back. The rooms do not have bar fridge and tea facility but these facilities are available in the common place next to the room. However, we were not informed about this. Beautiful place, excellent hotel and staff.